Native plants are in full bloom here in Illinois, the ‘Prairie State.’ So, early Saturday morning, we decided to explore a very special prairie. It was a rare, cool, end-of-July day, with skies threatening rain one moment and offering bright sunshine the next. 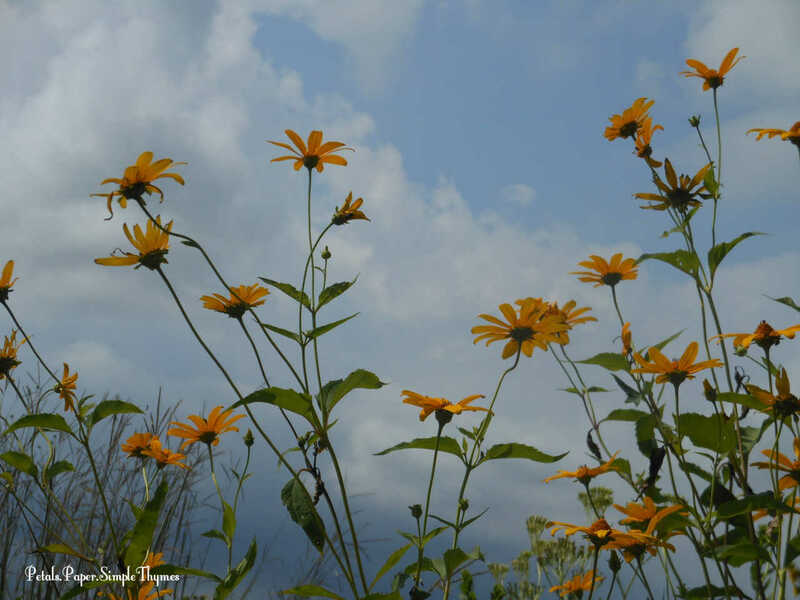 My husband dreamed of walking through the prairie in the rain observing the insects, while I wished for blue skies, just right for taking flower photos. Off we went… both of us watching the skies! 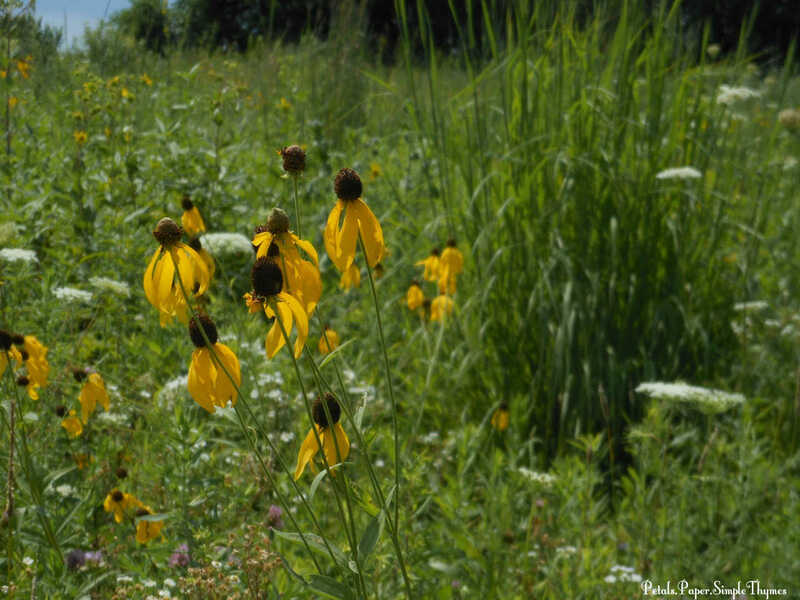 The Midewin National Tallgrass Prairie is the first national tallgrass prairie in our country. Once native prairie, this area then developed into a community filled with homes. Years later, the land became the Joliet Army Ammunition Plant producing ammunition used in World War II, Korea, Vietnam, and the first Gulf War. In 1996, the Department of Defense transferred ownership of the 19,000 acres to the U.S. Forest Service to create Midewin National Tallgrass Prairie. 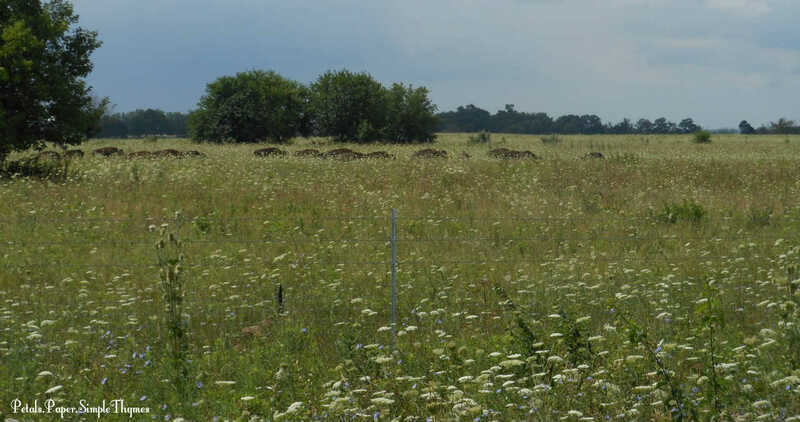 With the help of local conservation groups and countless volunteers, the USDA Forest Service has been working to restore this land to native tallgrass prairie. Today more than 13,300 acres are open to the public. We stopped in the Welcome Center first to pick up trail maps and learn about the prairie restoration in progress. Restoring a prairie of this size will take decades. 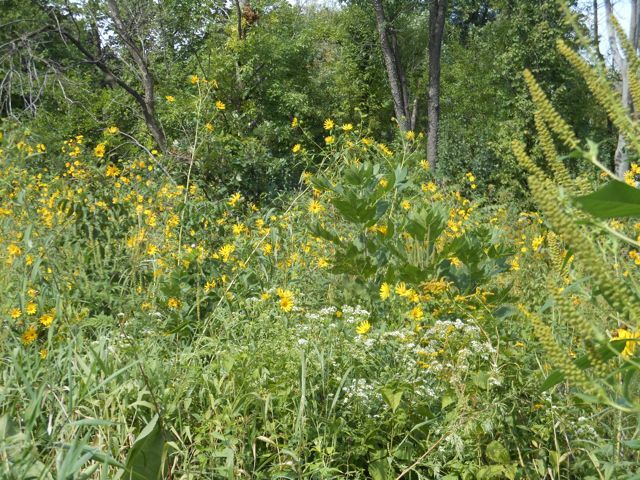 Much of what happens at Midewin is an ongoing experiment of trial and error as USDA staff study the small patches of native prairie that remain. Vast amounts of native plant seeds are being collected and spread each year by the dedicated volunteer workforce. Over time, Midewin staff continue to learn how the different parts of a prairie ecosystem work together. 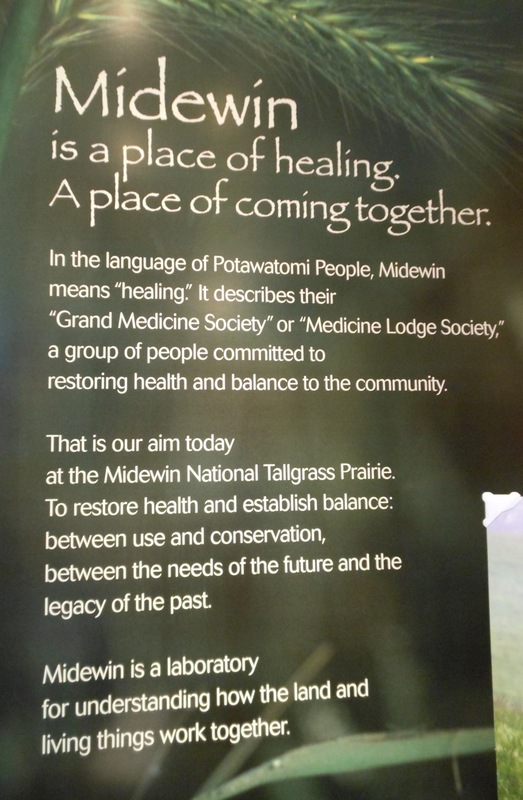 Midewin (pronounced ‘mih-DAY-win’) has made amazing progress toward its goal already. Friendly volunteer Rangers were eager to share the history and progress of Midewin with us. We began our prairie hike at the Iron Bridge Trailhead. As we hiked along the winding trail, it was exciting to see the progress of the largest prairie restoration underway in the United States. Our hot, rainy weather during July has helped the native plants put on a spectacular show of colors. 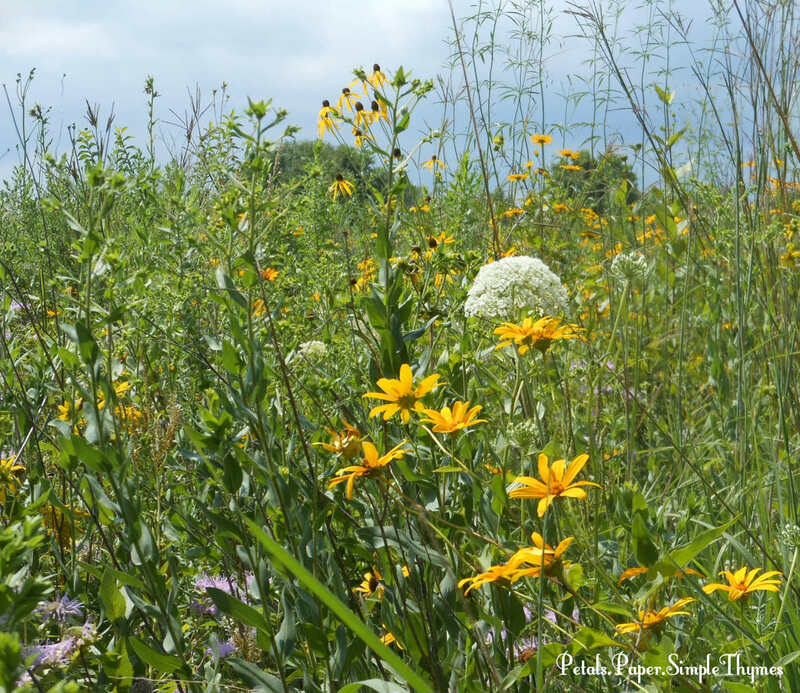 Walking through the tallgrass prairie helps us to imagine the time when 60% of the landscape of Illinois was covered in prairies. The grasses and native flowers often grew as tall as a horse and its rider. As covered wagons made their way through the prairies in the early days, only the tops of their canvas-covered wagons could be seen above the tallgrass prairie. They truly looked like ‘prairie schooners’ bobbing slowly through the waves of the tall prairie grasses. While the prairie wildflowers and grasses grow to impressive heights, most of the plant is below the soil with its extremely long root system. In addition to the roots, microbes, insects, and burrowing animals also play a critical role in the underground ecosystem of the prairie. Over time, the tallgrass prairies created the deep, rich topsoil of the Midwest. Once the valuable soil beneath our prairies was discovered, the tallgrass prairies disappeared quickly. In just 50 years, the prairies were replaced by farm crops and pastures for livestock. Today, there are less than one hundredth of one percent of the tallgrass prairies remaining in Illinois. We are so fortunate that volunteers are working to restore Midewin. 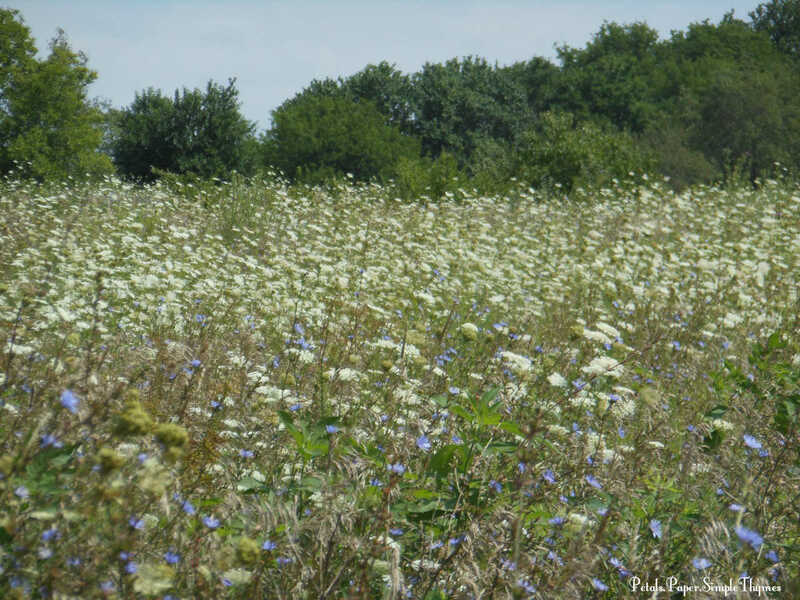 They carefully harvest the seeds of wildflowers and grasses, spread the seeds, remove invasive plants, maintain the trails, and teach visitors about this valuable prairie. 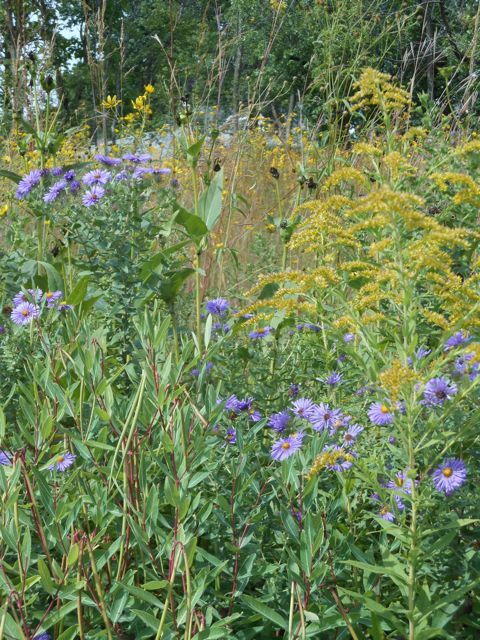 The prairie wildflowers and grasses attract many pollinators vital to the restoration process. 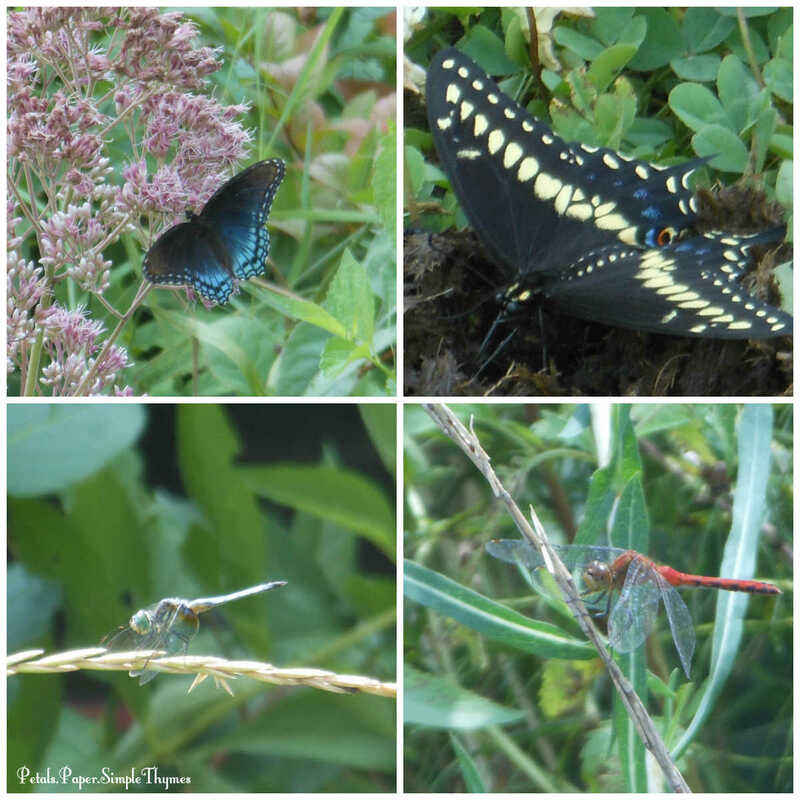 As we hiked, we were entertained by the birds, bees, butterflies, and dragonflies. Cicadas were singing loudly in the afternoon sun. We hiked along the Iron Bridge trail in search of bison grazing on the prairie. Chatting with other hikers, we learned that none of them had seen any bison and were returning to the trailhead. So, we decided to turn off on another trail. I stopped to admire the Queen Anne’s Lace blooming profusely, and something moving near the horizon caught my eye. Could it be? As we watched, we could just barely see a line of bison moving through the tallgrass and native flowers. We decided to quickly hike up to a higher place on the trail and stopped to watch the herd of bison moving. It was truly an unforgettable moment to see these huge, iconic creatures moving across the prairie! Bison played a very important role in our history, as the Native American hunters followed them across the plains. Bison provided food, clothing, and shelter to the Native Americans. 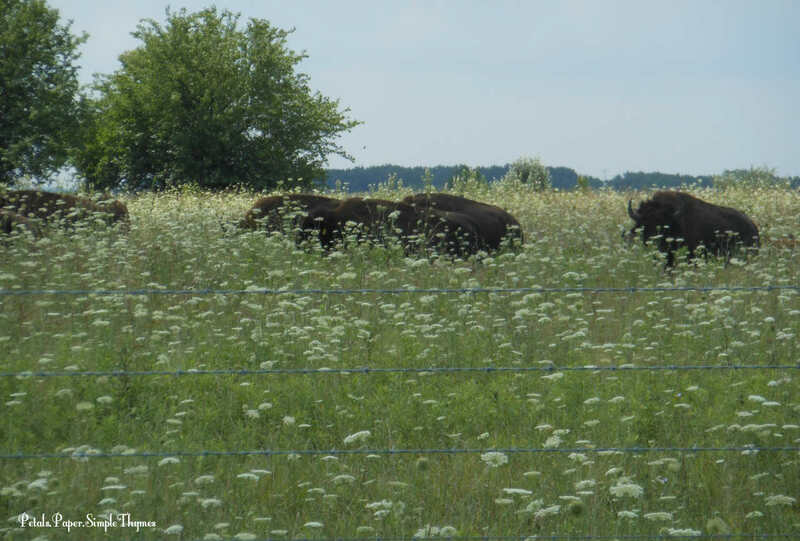 In the Fall of 2015, Midewin introduced bison to the prairie, in an experiment planned to last 20 years. Midewin prairie ecologists are studying the bison to see if their grazing patterns will benefit the ecosystem of the tallgrass prairie. Bison feed only on grasses, opening the prairie to more flowers and other plants. 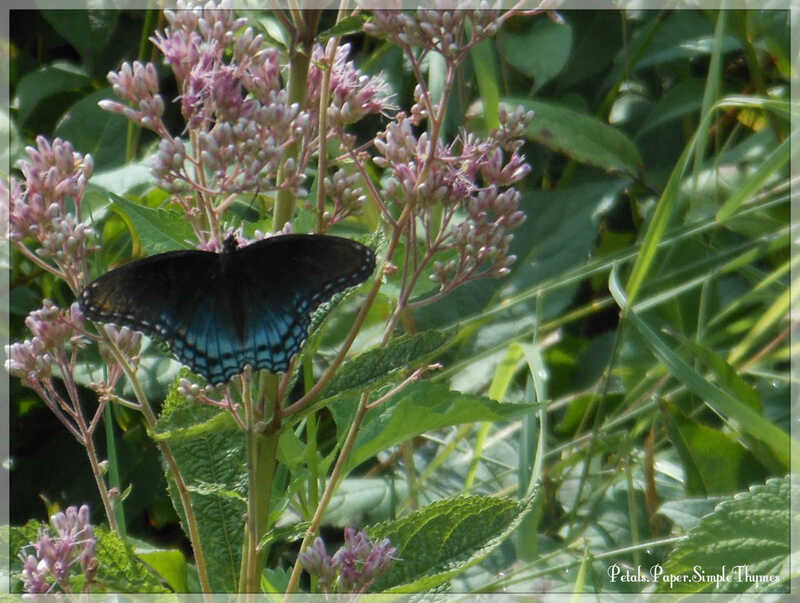 This attracts a variety of birds, insects, and other animals, increasing the biodiversity of the tallgrass prairie. The bison herd at Midewin, relocated from Colorado and South Dakota, includes 24 adults and 12 young bison. Just this week, two bison calves were born. As we watched them walking in a straight line, tails swishing, I was able to count 18 bison in this herd. Next time, we will bring binoculars! 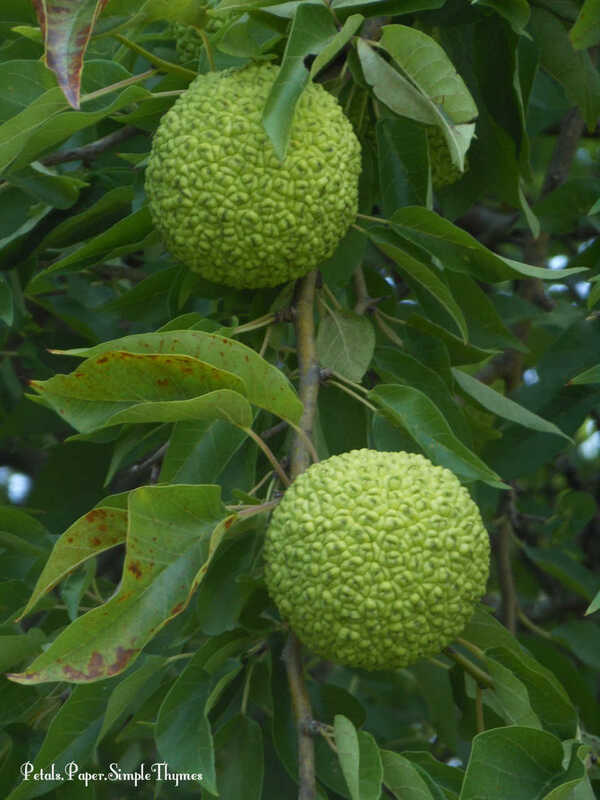 Turning off onto the Hedge Apple Trail, we passed a tree laden with this bumpy fruit. The Osage People used the strong, flexible wood from these trees to make their bows. These trees were often planted as wind breaks to prevent soil erosion. Their sharp thorns turned rows of Hedge Apple trees into cattle-deterring hedges, before the invention of barbed wire for fences. As we walked along the trail, we were greeted by vast areas filled with Queen Anne’s Lace in bloom. We followed a smaller trail deeper into the prairie. I stopped and spun around very s-l-o-w-l-y taking in all of this natural beauty. It felt just like I was standing in the middle of a beautiful, watercolor painting! If you ever have the chance to walk through a tallgrass prairie, it is an experience that you will always remember! 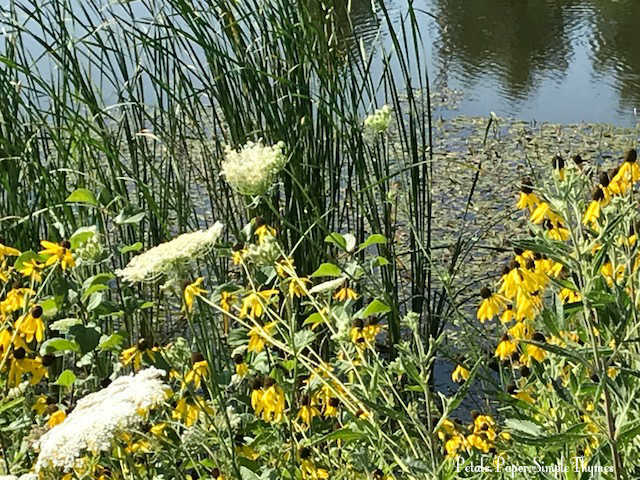 Midewin National Tallgrass Prairie is a treasure… and one that will continue to teach us to care for the land in so many important ways! Thanks so much for walking through the tallgrass prairie with us today! Have you ever visited a prairie? 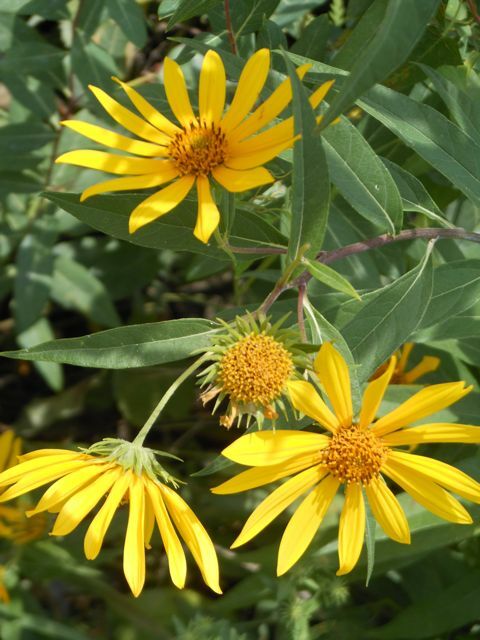 Do you grow any native prairie plants in your garden? During these glorious September days, I am never alone on my morning walks along the Great Western Prairie. My welcome companions are the singing cicadas, buzzing bees, chirping crickets, and fluttering Monarchs. Oh how I wish you could hear this symphony of nature! The prairie is a natural treasure, in full glory during early Autumn! Prairies are such an important part of our heritage in Illinois. 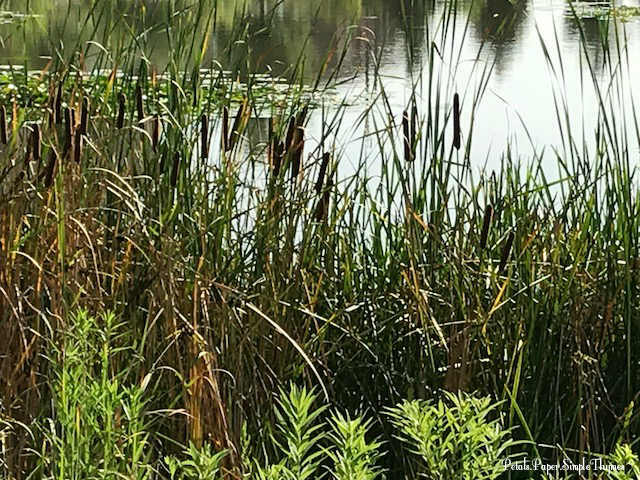 We are known as ‘The Prairie State.’ Long before North America was settled, prairies covered over sixty percent of the land that later became Illinois. Now, sadly, there are less than 2,000 acres of prairie (less than one hundredth of one percent) left in Illinois. 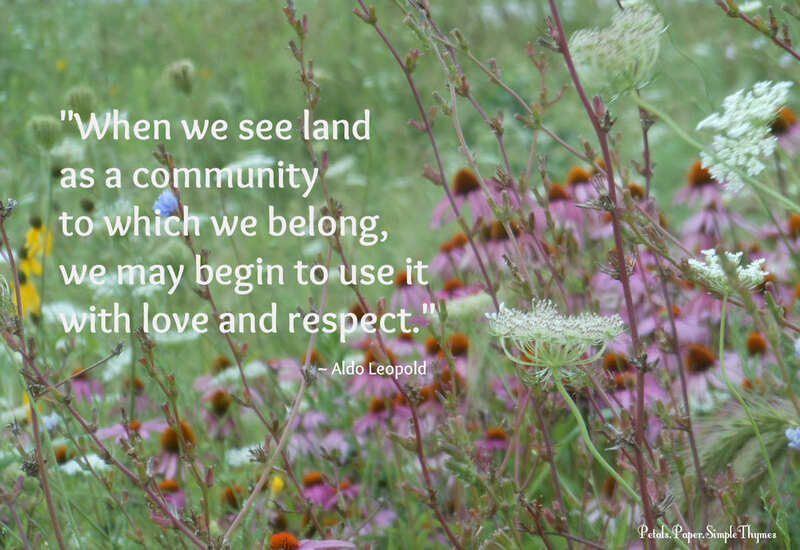 We feel so fortunate to have prairie land nearby! In fact, it is the oldest living thing in our town! Our Prairie Path follows a railroad route from the early days. The strip of land was mowed over the years, but it was too narrow to be developed. So, by pure happenstance, the prairie continued to thrive. 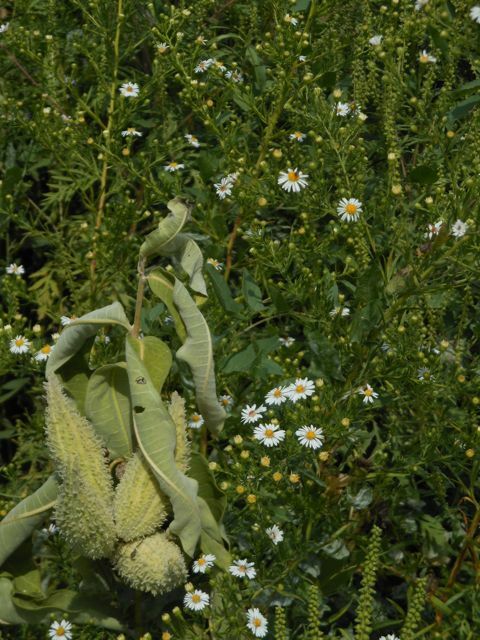 When the railroad tracks were removed, the prairie plants created a living museum of pre-settlement days. 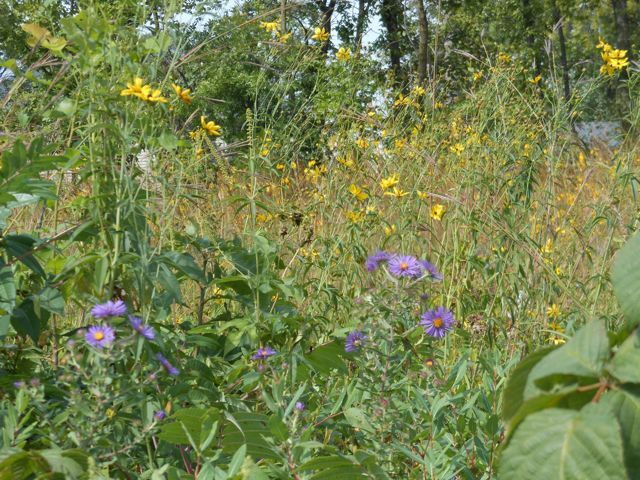 There are over 150 species of native plants, including spiderwort, asters, coneflowers, shooting star, bluestem, and Indian grasses in our nearby prairie. 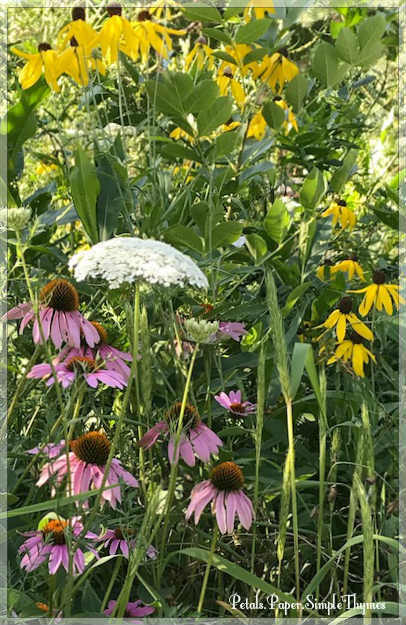 These native perennials are able to survive the extremes of heat, cold, wet, and dry in our Midwestern climate. 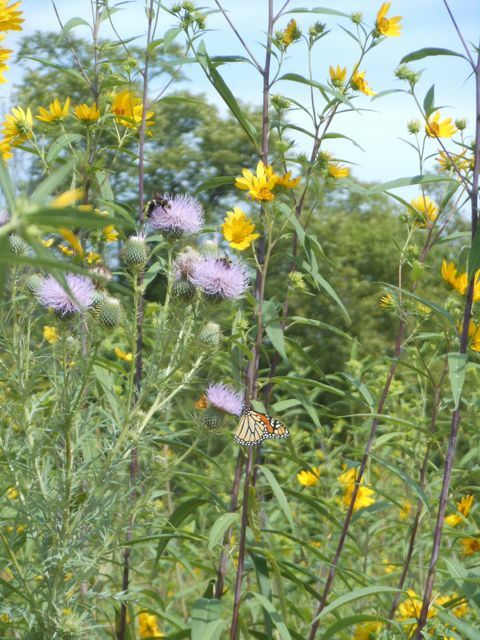 The Great Western Prairie has also been designated as a Monarch Waystation. 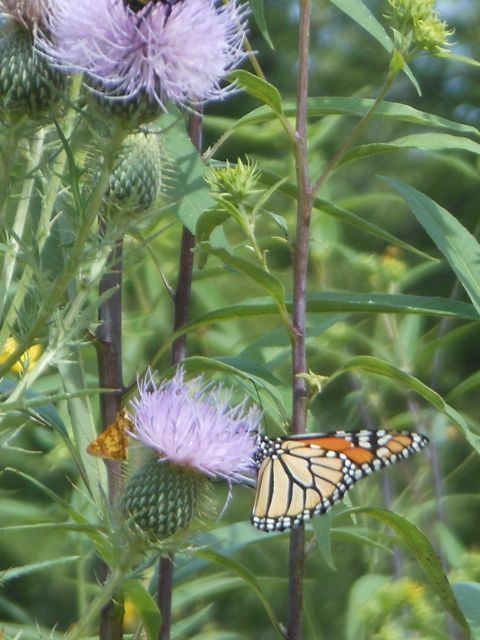 It provides Monarch butterflies with the native milkweed plants needed for their lifecycle, thistle blossoms for nectar, and tall plants and grasses for shelter, as the Monarchs migrate on their journey through North America. walking quietly, dreaming, remembering, and counting our blessings! Long ago, the native prairie ecosystems were maintained when Native Americans set fire to the prairies or lightning started fires on the prairies. Today our local Fire Department schedules a controlled prairie burn each year. Prairie fires spread very quickly destroying trees and shrubs that are not native, without harming the deep roots of the native plants. A burn works to renew the prairie, as ash from the fire adds nutrients to the soil. Within just a few weeks, the native prairie plants begin to grow again! We owe a huge debt of gratitude to the dedicated local conservationists and volunteers who collect the native seeds each year, preserving our prairie for many generations to come. to walk there, observe, listen, and learn throughout the seasons. back to the days when Native Americans walked through the prairies. 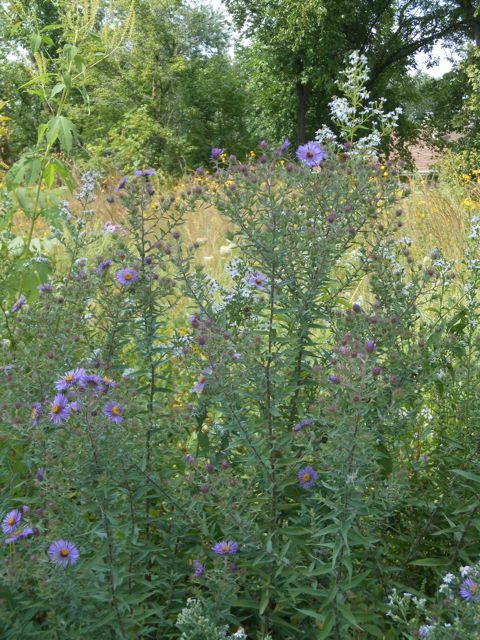 I find native prairie plants growing in my cottage gardens. They are the seeds of the past that still teach us lessons today. P.S. Where do you love to walk in your part of the world?